following the onset of palpitation and dyspnoea. She was taking digoxin and diuretics. Rhythm: Atrial acuvity is represented by a series of rapid flutter or P waves at a rate of 280 per minute. These are best seen in the inferior leads II, III and aVF where they have a saw tooth appearance. Irregular QRS complexes of normal duration (less than .10 seconds) are present at a rate of approximately 45 per minute. The number of P waves preceding each QRS complex varies between 4 and 8 showing that a variable degree of AV block is present. Morphology: The voltages in the precordial leads fulfil the criteria for left ventricular hypertrophy: the S wave in V2 exceeds 25 mm and the sum of SI + V6 = 45mm. 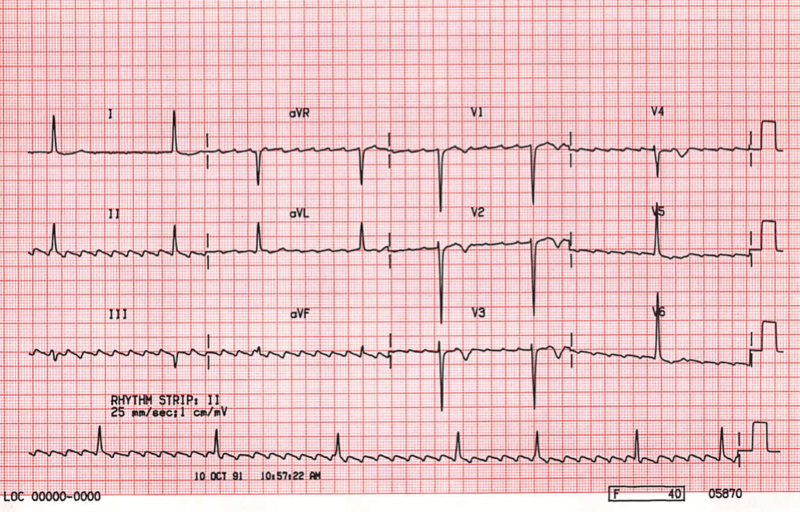 There is ST segment depression and T wave inversion in leads facing the left ventricle: I, aVL and V4 – V6. Atrial flutter is associated with rheumatic valvular disease as well as ischaemic and hypertensive heart disease, it may also be seen with mitral valve prolapse; it may also occur without other features of cardiac disease. Initially the arrhythmia may occur in discrete attacks but later these become more long lasting and may precede the onset of permanent atrial fibrillauon. Calcific aortic stenosis in addition to her known mimal valve disease was present and was thought to be largely responsible for the changes of left ventricular hypertrophy recorded. The atrial rate in atrial flutter is usually around 300 per minute and usually 2:1, 3:1 or 4;1 block results in a more rapid ventricular rate than seen here. The slow rate of AV conduction seen here improved after digoxin was withdrawn but damage to the conducting tissues from calcification in the region of the stenotic aortic valve was a further possible contributing factor.